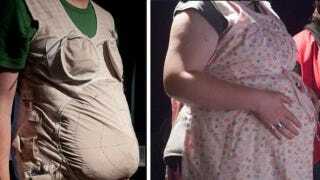 Japanese inventors have come up with a "Mommy Tummy" pregnancy suit intended to let men experience what it's like to be with child. The jacket features bladders in chest and stomach that fill with water and sensors that simulate the sensation of a kicking baby. It's certainly a noble effort, but wearing a backpack over your belly can't replicate the feeling of having a fetus dance on your organs.